White bronze decorative heat registers are strong enough to use in your floor, wall or ceiling. The metal vent is sand cast to have a 1/4" thick faceplate. Handcrafted decorative heat registers are produced here in the US, ensuring you a quality product. The metal vents have a steel damper which will open and close off your airflow. These Renaissance round decorative heat registers come with screws for installation in the wall or ceiling and screw holes are optional. 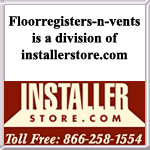 If the metal vent is being used in the floor, simply drop it into place for installation. The decorative heat registers are listed below according to the measurement of your duct opening. Order all of your metal vents together to save time and money on shipping. Tip: Our round decorative heat registers are made with an additional 2 inches around the faceplate. The metal vents are listed above according to the measurement of your ductwork opening. The 12 inch round register fits into a hole that size. Measurements are approximate since each item is made to order. Important: Renaissance decorative heat registers will ship after 7 to 9 weeks of an order being placed. These custom metal vents are considered special order, non-returnable items which cannot be canceled once payment has been made. More decorative heat registers can be found on our site which are made by Classic Grilles. 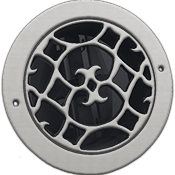 This round metal vent is available without the damper unit if airflow control is not needed. Order these decorative heat registers to replace old and boring vents and create a timeless look in your home.